Funded by the National Institute on Drug Abuse, this evidence based series imparts the latest research into urban relapse prevention strategies. This program includes the 5-Video Series plus a Free Counselor’s Guide with Reproducible Client Activity Worksheets. Prior to release, it was screened and revised based on input from hundreds of streetwise recovering addicts and a panel of national experts. 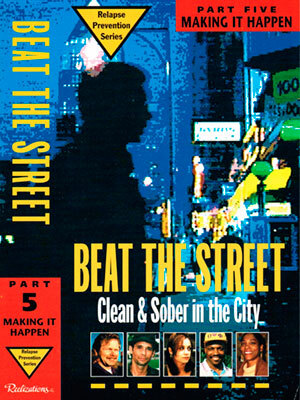 Each part of this 5-tape series covers a different aspect of urban recovery and relapse prevention. 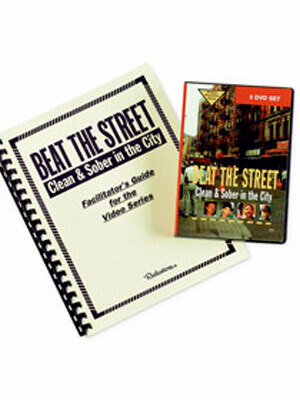 FREE 170 page Counselor’s Guide to use with the Beat the Street videos makes this a complete CURRICULUM. Includes 43 client activity worksheets for you to photocopy. Clients make personalized relapse prevention plans, applying what they have learned. 98 discussion questions give counselors a structured format for leading discussion following each tape. Helps viewers clarify the relapse traps and prevention strategies most relevant to them. CUSTOMIZE FOR TEENS! An adaptive guide is available to help you modify this popular relapse prevention curriculum for use with youth. Below you will find details on our research report that is the basis for our award winning program, “Beat the Street: Clean and Sober in the City.” It is the most widely used curriculum on relapse prevention for inner-city recovering addicts. Click the title to read or print this addiction rehabilitation research report. Hit your browser’s Back button to return to the previous page. In recent years, as the crack epidemic profoundly affected our nation’s inner-cities, numerous clinicians have stated the need for more treatment tools with which to help inner-city addicts who will be returning to extremely challenging environments upon discharge. These clients are often homeless, unemployed, have a spotty work history or even criminal record–circumstances which do not automatically change upon becoming abstinent. Treatment personnel themselves say they have lacked concrete examples of how inner-city addicts can successfully cope with the many stresses and high-risk situations they encounter on a daily basis.